How Those with Different Motivational Behaviors View ‘The Dress’ – Competitive Edge, Inc. The big news last week was “the dress.” It was still trending this week as people debated whether the dress was white and gold or blue and black. People even began to debate whether or not it was really important to have that conversation. Although science tells me that one can’t tell which way someone will see the dress, I began to wonder how individuals with different motivators would look at the topic. For instance, those who are theoretically motivated would be fascinated by the science behind why people saw the dress different ways. They were the ones reading the stories on Slate.com or Wired and listening to the scientists on NPR as they discussed the way the brain works. An individual who has utilitarian motivators, someone who has a passion for practicality, may not have looked very deeply at it at all. They would go with their first instinct. However, as the story seized the attention of the populace, this individual may have started to wonder how to capitalize on it. Would it be possible to manufacture a dress like this on a large scale and sell it to the people? It would be an instant conversation starter at any party. Those who are aesthetically motivated probably looked at the detail of the dress after making their decision of what colors they saw. They likely admired the cut, the fabric choice and the colors and loved the fact that it captured the world’s imagination. 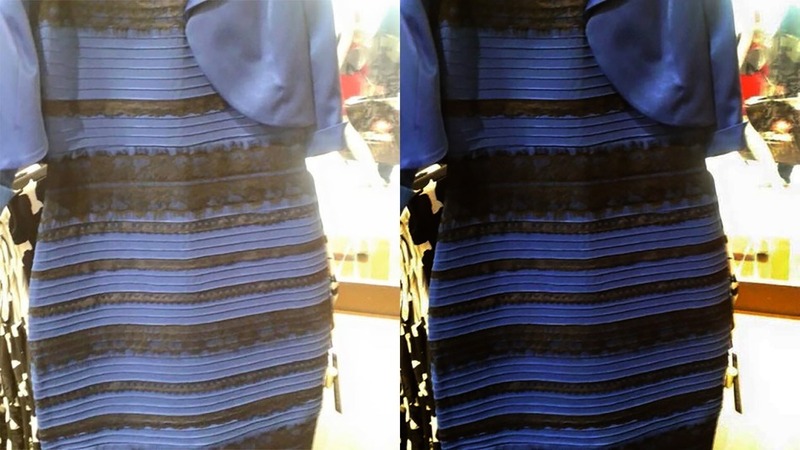 For a few days, all eyes were on this dress and people debated color, photography, art and intent. How wonderful for those who have an appreciation for harmony and beauty. Individuals with social motivators were the ones who weighed in on every Facebook thread and comment, discussing it with their friends and trying to see the dress from their eyes. Socially motivated individuals want to help others, so if someone didn’t understand why he or she didn’t see it the same way as all of their friends, the socially motivated person would tell them they completely understand and would provide them with links to the explanations. The individualistically motivated person was the one looking for the most popular result so that he or she could claim to have known the right answer all along. They would also try to sway others to their point of view. Those with individualistic motivators want to win and hold a lot of influence over others. Lastly, the traditionally motivated individual is likely the one who saw it one way and then felt that a dress that could cause such debate did not belong at a wedding in the first place. This person worried that the dress took attention away from the bride. In their mind, it is more appropriate to dress conservatively in muted tones to a wedding so that the bride and groom are the stars of the show. Tell us what colors you saw, but more importantly, tell us what you think of all the hub-bub surrounding the issue. Your answer will likely say what motivates your behavior.